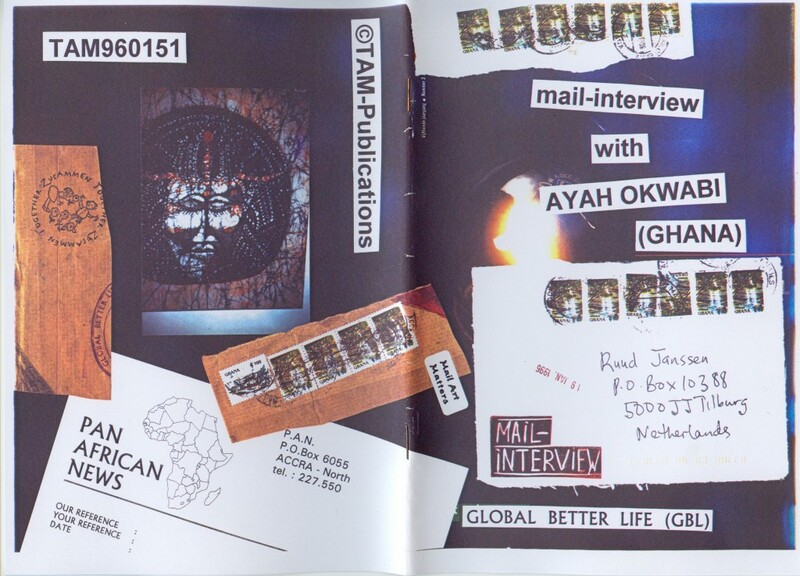 mail-interview with Ayah Okwabi – Ghana – iuoma.org – Interested in Mail-Art? AO : Dear Ruud, thanks for the invitation to participate in your mail-interview project. I got involved in mail art in 1979 when Volker Hamann introduced me to his Anthropological Art Project. Anthro-Art was Volker’s idea of linking Anthropology to Art. Later I suggested a meeting of mail artists involved in the AnthroArt network to work on a community-based workcamp project in a village in Ghana. The project was to take place under the auspices of the Volun¬tary Workcamps Association of Ghana (VOLU) which has been organizing international workcamps in the rural areas of Ghana since 1956. Volker tried to get as many mail artists as possible to visit Ghana but finally he was the only artist who arrived in the Summer of 1985 for the project. Ayah Okwabi (AO) and Volker Hamann (VH) met in Accra on 21 July 1985. 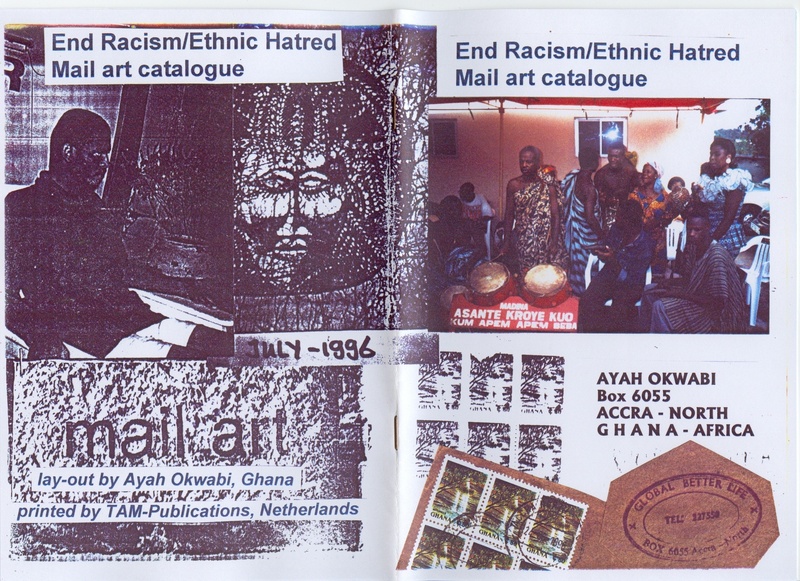 The shows in Ghana (the first mail art and correspondence art shows in Black Africa) connected people in different networks such as MAIL ART, THE FOURTH WORLD and as well as different institutions (Ghana Institute of Journalism, Mfantsiman Secondary School, Ghana United Nations Students and Youth Association) plus Volunteers from Europe, U.S.A. and Ghana in a workcamp to construct a school classroom block at Saltpond in the Central region of Ghana. Some of the contributions for the show were concepts of projects to be realised in Ghana. Although they were among the most attractive contributions, they were inappropriate because of their intellectual nature or needed technical equipment which was unavailable to us (sometimes we had neither electricity nor water) or they were politically inappropriate. The contributions were presented in different sections – Apartheid, Tokokoe Project (where the exhibition was to take place initially but was changed later), peace and politics, mail art publications, mail art, networking addresses and announced shows. The headmistress of Mfantsiman Secondary School, Mrs. Asiedu, formally declared the exhibition dubbed “Ghana Show” opened. She stressed the role of mail art in promoting international understanding among peoples of the world. This is particularly important in Ghana where mass media is inadequate and mail is often the only available medium for international correspondence. At the Ghana United Nations Students and Youth Association convention, the show took on a political meaning because issues of apartheid in South Africa and independence for Nambia, which was by then a colony, were being discussed at the meeting. Finally VH gave a performance at the Ghana Institute of Journalism in Accra, about new media in relation to journalism. We also visited St Georges Castle in Elmina which was the former centre for the export of Slaves to America. RJ : How difficult is it to be a mail artist in Ghana? AO : I have difficulties getting people interested in mail art because of the rising costs of international mail and the fact that there are no financial benefits to be derived by participants from Africa. I started a personal magazine called ‘GongGong’ in which I publis¬hed some mail art articles and announcements but financial difficulties compelled me to stop after just two editions. Indeed, the tradition of self-publishing which has contributed to the growth of mail art in Europe and USA is non-existent in Africa. RJ : Is mail art and networking just a luxury or does it bring something essential? AO : Mail art brings something interesting for one to do and observe. It opens up possibilities to know and meet artists through networking. When I started mail art with Volker Hamann, I didn’t imagine that I would meet him in person but, six years after we started communicating in 1979, we met in Accra in July/August 1985. On my return visit to Germany, in 1990, I also met Henning Mittendorf. I think the mail art network is able to promote mutual interacti¬on among people over long distances from diverse cultures which is quite unique. Mail art networking provides a channel for ones creative potential to be realised. Practising mail art enables one to communicate at a distance with friends who would otherwise be out of touch. Sometimes, mail shatters the isolation I feel here in Accra where I can find few people to share ideas with about the network. Of course, mail art can be described as a luxury because the body does not need it like water or food or air to survive. However, it stimulates the spiritual aspects of the personality and a feeling that we have a community of friends we can always rely on not on the basis of our physical appearance or money but because we share common ideas and interests. Individuals will come and go but the network lives forever! This means we may lose contact with individual artists but we can always make fresh contacts and make new friends provided we continue staying in touch with the network. Mail art is a supererogatory activity. Its not absolutely required of the person but is done for the sake of greater artistic perfection. RJ : Besides the “common ideas and interests”, as you say, most mail artists have also their specific ideas about what they want to use the network for, a goal they want to realize. What’s yours? AO : For me, the network is like a mirror in which I can get people to focus on the current issues and challenges facing the world in general and Africa in particular. Some of the themes of my projects in the past, such as “Africa Arise/Food for the hungry” provide concrete examples. “Africa Arise” focused on the issue of apart-heid in South Africa and how it can be eradicated. “Food for the hungry” addressed the food problem which is still a problem in some African countries either because of poor weather conditions, civil war or ineffective government policies. “Population” has also been a theme of one of my projects because the issue of a rapidly growing population and how to provide for the needs of more people is a burning issue that faces many African States today. My latest project with the theme “End Racism/Ethnic hatred” is a problem that has global dimensions. What can we do as mail artists to change the thinking of racists? I feel a personal resposibility to promote awareness of the chal¬lenges, or social problems that people face. Once the necessary awareness has been created, we can begin to think of possible solutions. In addition, the network serves as a channel for exchanging visits with fellow mail artists scattered around the globe. After making contact via surface mail or other media, my ultimate aim is to meet in person with artists in my sub-network and get to know them better. I am aware as an African artist of the expense of travelling by air to Europe or U.S.A. or South America but it is one dream that I cherish very much. I hope that I would be able to meet in person with you in the near future. RJ : Well, that is something the future will tell. I’m sure it will be interes¬ting to meet for both of us, but for now the questions and answers have to travel by mail. A new thing in networking and communication is the use of e-mail. Although in the USA and Europe already lots of people use the internet, this communication-form isn’t that common or even available in Africa. Because some networkers now start to focus more and more on this new ‘gadget’ this might mean more isolation for Africa. What do you think? (With my next question I also sent Ayah some articles about my experiences and thoughts in connection to telecommunication and internet). AO : Basically, computers are beyond the means of the average person in my country, Ghana. Besides, even when one has a computer it costs 100 dollars a month to have access to internet which means that it is only companies who make a good profit can afford this facility. Given that mail art and money do not mix, it would be im¬possible for me to get on the internet. The increasing isolation of Africa as a result of the emergence of the information superhighway has been the topic of some confe¬rences held by infomation experts here in Africa. The so-called information revolution is only being experienced in isolated pockets in Ghana. I get the feeling from the number of calls you have on e-mail that I must be missing a lot of the action going on in the internet, I send and receive only surface mail for now. Sometimes the quality of surface mail I received is unsatisfactory. Some mail artists simply send you a black and white Xerox with a line of greeting which sounds rather shallow. Meanwhile, I wonder how you are able to finance your huge financial bill using the internet and sending out 100 or 150 pieces of mail a month? RJ : Ah, a question for me? Actually the e-mail isn’t that costly here in Holland if you know the ways. I teach informatics, and the e-mail address I have is a free one. I don’t have to pay for anything else than the phonecosts, and therefore I can easlily send out 10 large e-mails for the same costs as a simple air-mail letter to the United States or so. As for financing 100 to 150 pieces of mail each month, I do have a paid job besides all my art activities, live relati¬vely small (and therefore cheap) and don’t have a family to feed. I hope this answers your question a bit. I guess that the money one can spend on the mail one sends out, depends also on the country one lives in. With the minimal month-salary here in Holland one can send out about 1500 letters abroad (if one didn’t need money to live and eat that is…..). So actually I don’t spend that much on mail most of the time. How is the situation in Ghana? How are the postal costs in regard to the average month-salary, and do the living-costs allow people to even spend money on mail (art). I gu¬ess here lies a good reason why there are so little mail artists in Africa. Am I right? AO : Regarding the postage expenses the situation here is quite different. Most people spend more than 50% of their income on basic needs such as food and then rent and bringing up their family takes up the rest. On the average salary of 100,000 cedis one can send about 330 letters to Europe from here in a month. Given that there are hardly any mail artists in Africa who are really actively engaged, most of my correspondence is with Europeans, Americans or Latin Americans. Letters to the Americas are more expen¬sive. It is true that because of difficult economic circumstances, most people here cannot afford to send mail (art) just for the fun of it. People send mail for concrete benefits and consider mail art fanci¬ful and not worth spending time on. I have no family yet and stay with my parents so I can manage to send mail art but not as much as I would like to. RJ : I have noticed that especially in rich countries, the mail artists tend to send out sometimes quite strange things. The quality of the mail seems to get less, and the quantity gets larger. It results in chain-letters, add-to xeroxes, or just large quantities of xeroxes. This kind of mail art you probably also received. What do you think of them? AO : Chain-letters, add-to xeroxes or just large quantities of xeroxes are simply boring and unimpressive. They reveal absolutely nothing about the interests or motivations of the senders. Most of the con¬tributions I have received for my “End Racism/Ethnic Hatred Show,” are of this type. Just imagine having the obligation to prepare a catalogue about an exhibition to be organized for this pro¬ject and sending it in exchange to people who simply cut some pages from a magazine or send an irrelevant black and white xerox as a contribution to a show! Mail art coming from industrialised, rich countries needs to be of a high standard and a good example to encourage more people in Ghana and Africa in general to parti¬cipate in the network. RJ : Of course the mail artists living in a rich country don’t have to be rich. But I understand the difference all to well. The xerox here in Holland is something very cheap, it costs only 10 cents (10% of the postage costs of a letter air-mail inside Europe). Also you can get free postcards at many places with some kind of advertising on it, so something like that here is even free. I guess the reason some mail artists send such things to certain mail art shows is just that “they want to be included” and hope for a nice catalog. They don’t always realize that by sending poor quality, the organizer of the mail art show isn’t that much encouraged to make a good docu¬mentation, and this is some kind of vicious circle that makes the documentations of the last years I am in mail art quite poor (with some wonderful exceptions of course of mail artists who have found good sponsors). How important is the documentation of a mail art project in your eyes? AO : Documentation has to be done in a detailed way to make it interesting. To do so one must have received good quality mail art. It is easy to send a ready made black and white xerox or postcard to a show. However, when one gets a reasoned response one is inspi¬red or motivated to give back documentation that senders are happy to receive. A catalogue with texts, articles, photos and listings takes time and money to prepare. Stuff that is ready at hand and quick to send is hardly the right material. Documentation promotes fresh contacts and networking among artists in the mail art (network). This ena¬bles us to prepare organised information on mail art to show pe¬ople who know nothing about mail art. The question is how do you finance it? For me even after producti¬on of the documentation, the fact that most mail artists are in EUROPE or AMERICA means additional mailing expenses. One way out is robbing Peter to pay Paul or make the money elsewhere and use it to finance networking. RJ : Yes, most mail artists live in Europe of America. As a person living in Europe I see the difference in mail art between the mail I receive from outside Europe compared to the mail I get from inside Euro¬pe. Do you notice any difference too or is it just my perception? AO : There is a great deal of difference between mail art from Africa in relation to what comes from Europe or America regarding technology. Snail mail, the handmade and handwriting is typical for mail art from Africa. E-mail, Fax or computers are available here, but these are mostly owned by institutions and individuals who do not understand mail art. It is easy for me to gain access to a friends computer if I use it to publish books which I sell and pay back something for using the computer, but he would consider it a waste of time and electricity if I use the computer to prepare documentation for a mail art project which brings no money to his pocket. Often I get no response when I try to contact mail art addresses in Africa which are very few indeed! RJ : Is there also a difference from the mail art you receive from Europe compared to mail art from America? AO : It is really difficult to make a clear distinction between European and American mail art. Both regions make use of high technology equipment more often. However it would appear that I receive more mail art magazines/publications from the United States than Europe. Also, generally, it is easier for me to decode handwriting from Europe than from the U.S. My favorite correspondents can be found on both continents. Mail artists are best assessed on the basis of individual quality of their work. The only softcopy material in the form of three recorded cassettes of radio programmes about the history of Indians and the coming of colonialists and settlers to the United States for my “End Racism / Ethnic hatred” project came from San Francisco in Cali¬fornia. This contribution displays a clear understanding of the sub¬ject of racism in one part of the world which has revealed new things about the history of the United States to me. RJ : The history in connection to mail art is also interesting. The last years a lot has been written on the subject of mail art. Do you think is is important for mail artist to know about their roots? (Between the sending of the previous question and the receiving of Ayah’s answer the city Accra was in the news because of the refugees from Liberia who fled from Liberia on a large boat and were stranded in the harbor of Accra, Ghana). AO : The publications you sent were quite revealing. The TAM Rubber Stamp Archive is much larger then I thought. I was impressed to hear about Rubber Stamp companies as participants in your project. Can you please send info about some rubber stamp companies? To your question. Much has been written about mail art. So doing a project that reminds us of our roots brings meaning into the action. I look around me and to my personal experience to get themes for my projects. However, your roots alone should not always be the basis for the themes you chose for projects. There are several topics for mail art projects that may have absolutely nothing to do with where we come from. Imagination and creativity play quite an important role in the net¬work. This explains the great variety of themes and artistic projects in the network. RJ : Accra was on the news…. how are things there? The first rubber stamp from Ghana for the Archive came from you (thank you!). How easy or difficult was it for you to get this stamp made and what is “Global Better Life”? AO : The arrival of a Nigerian freighter, Bulk challenge at the Ghanaian port of Takoradi on May 14th with 3,000 Liberian refugees fleeing factional fighting among the war lords underlines the relevance of the theme of my current project, “End Racism / Ethnic Hatred”. Earlier on the refugees had been refused entry by the Cote d’Ivore authorities which illustrates the fact that the idea of political asylum has come under increasing strain in both the developed and developing world. Already 750,000 Liberians have fled their country as a result of the six-year old civil war which has been the result of ethnic hatred among Librerians. Ethnic conflicts should be the concern of all because their consequences are bound to affect outsiders one way or the other. For example, many soldiers from Ghana and other West African countries have lost their lives in peacekeeping duties in Liberia. Also, the Ghanaian government and people have been making sacrifices to contain several Liberia refugees who have entered the country. Global Better Life is an organisation whose main objective is to bring about a better life for all before the end of the century. I have registered the organization with the registrar General’s Department as a publishing, advertising and public relations company. In mail art I am using Global Better Life as a pseudonym or name which I can use in the network in addition to my normal identity. I have been fascinated by the use of names in mail art like ANTHROART by Volker Hamann, POSTAL ART NETWORK (PAN) or TAM. It was not easy to get a rubber stamp because I don’t have the ability or the materials to make one. I designed one which was made for me at about SIX thousand cedis or approximately five United States dollars. That is quite a lot of money in local terms. RJ : In your catalogue of your project “End Racism/Ethnic Hatred”, I read that you already arranged two exhibitions with the contributions. How were the reactions? AO : Most visitors to the two exhibitions who were mostly young people found the contributions really fascinating and would like to partici¬pate in the network. One lady wanted to know how she was going to finance video or audio cassettes that she would like to send artists in other parts of the world. People wanted to know how the network operates. I tried to explain but some did not really under¬stand. Indeed, it is not easy to explain mail art to some beginners. Above all, the atmosphere at the exhibition was businesslike but detached some of the comments were: “does this postcard reflect the theme of the exhibition or is it just an artwork?” or “Oh, thats an appropriate description!” And so on. (Again Africa is in the news with the Coup that has taken place in Burundi). RJ : Well, I guess it is time to end this interview now. Maybe I forgot to ask you something? AO : My comment on the recent coup in Burundi, where a Tutsi by name Major Pierre Buyoya, former head of State has taken over from Sylvester Ntinbantunganya, a Hutu, underlines the fact that the competition between the two ethnic groups, comprising Hutu’s and Tutsi’s is going to continue for some time. That is really a pity. Sanctions are now being applied against the new regime to return the country to democracy. Time will tell whether this approach will be succesful. Well, all good things have an end. I think it has been a great honour and privilege having this conversation with you. Your effort to create a bridge between Africa and the global mail art network is surely commendable. Keep it up. With warm greetings, Ayah. RJ : I want to thank you too for your time and energy during this interview Ayah. I sure hope that more Europeans and Americans realize that the world is a bit larger than ones own continent, and that we all live on the same planet. My best wishes to you too, and we’ll sure keep in contact!